The past two weeks have seen some big steps forward for two hugely exciting projects: Room 7, and Techfugees France’s fellowship for women refugees. From the tiniest seeds of great ideas, both initiatives have now reached the point where we can take stock and learn lessons for the future. 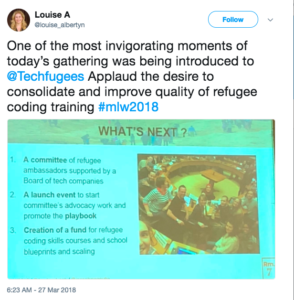 Room 7 is a consortium of coding schools which spun out of UNESCO’s Mobile Learning Week in 2017, led by Tom Liam Lynch from BabbleLab and Techfugees, with the aim of helping refugees, in particular young refugees, develop the digital skills which will be an essential requirement of tomorrow’s job market. 2018’s event, hosted in Paris, was an invigorating opportunity to present the progress our teams have made in just 12 short months. Tom and I have already reached the point where we can produce and promote a playbook, put together by two researchers one being a refugee himself, filled with details of where the pain points lie in such a project, as well as the opportunities this type of skill-sharing opens up. Given that Room 7 is made up of such disparate teams spread so far around the world, it’s small wonder that their findings throw up some fascinating comparisons. For example, there’s a huge difference between mixed refugee/local coding schools in Jordan like RBK, and German coding schools composed solely of refugees like RediSchool. Funding is obviously a factor, with limited state funding in Jordan making mixed classes a necessity, while more generous private funding in Germany enables a learning experience tailored specifically to people with refugee status. At UNESCO, we encouraged more organizations to be part of the consortium, appointing reps from each participant, and working towards an all-refugee steering committee. From there, the challenge lies in creating a unified framework for the initiative and proving to investors that this kind of thing translates into more jobs, as well as a better-skilled workforce to fill them. You can learn more about Room 7 by joining the newsletter and Facebook group, and by the way, Redi School is organizing a hackathon at the end of this month – 20th-21st of April – with the refugees graduating from the school this semester: grab your ticket here. Meanwhile, our pilot fellowship for women refugees begins to focus on equipping participants to enter a job market which is being disrupted and revolutionized, even as we speak. Facebook Paris offices will welcome the women on the programme next week Monday to mingle with established female entrepreneurs and startup CEOs, which will bear fruit down the line. But the pilot itself is currently focused on grassroots skills. Key to the fellowship’s success is empowering participants to realize their ambitions on an equal footing to the native workforce, helping them aim higher than simple retail work. With that in mind, they’ve been focusing on digital skills, mastering platforms like LinkedIn to make themselves visible, and getting to grips with tools to help manage their time and maximize their efficiency. Knowledge of freelancing platforms and eBay also unlocks the ability to make a little bit on the side via the gig economy. This is a topic I’ve discussed a lot lately with politicians and advocates for refugee rights. The fallacious idea that refugees are here to do jobs which the native workforce doesn’t want to do misses one huge factor: automation. Automation is already starting to encroach on positions formerly held by working-class communities. People worry about their jobs disappearing, see refugees turning up, and come to the wrong conclusion. Those peddling a fear-based, anti-immigrant narrative are all to eager to exploit this error of logic. The workforce of tomorrow, whether native or immigrant, needs the digital literacy to keep pace with a hugely disrupted job market. With so many incoming refugees being children, it’s never been more critical to ensure everyone gets the opportunity to develop the skills they’ll need in the years to come. For this reason, I’m hugely proud of the work being done by the coding schools part of Room 7 and the women’s fellowship, providing these opportunities and passing on a message of inclusive, informed optimism.